Herb and I observed Adele's OT and PT sessions today. She has made amazing progress in just the week since she's been in rehab. She no longer needs to wear the neck collar, except for during therapy. That has been a real relief! She is also now walking the length of 2 corridors with a walker and no assistance. She still has a lot of pain and fatigue at times, but that is to be expected so close to both her injury and the surgery. The team is trying to manage her pain, often successfully. It looks like she may go home next Friday, 11/17/17 with home services. Visiting hours at Braintree Rehab are weekdays 12-1pm and 4-8pm so as not to interfere with therapy times. On weekends the hours are 12-8pm. Keep up the great work Adele! Adele is doing better the past 2 days on Orthopedic floor at South Shore Hospital. She's alert and out of bed in a chair with only a soft collar. She has just begun Physical Therapy and has taken only a few steps. The medical team thinks she will probably be ready to go to a rehab as early as tomorrow, Tuesday, but they'll make a final decision tomorrow morning. We're looking at options like Braintree Rehab and the 2 places she's gone before- Rose Court and Baypointe. Still working on pain control as the surgical wound in her neck heals and on her progressing to being able to eat (and safely swallow) solid foods again. She is also still on oxygen most of the time. Mom fell and broke the top 2 vertebrae in her neck last Friday. 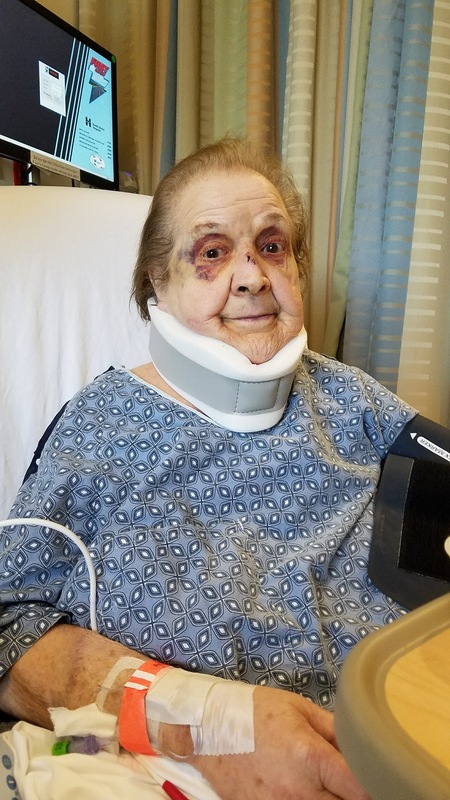 After days of getting stabilized while wearing a hard neck brace and an oxygen mask, she had surgery yesterday to fuse the vertebrae. Her broken nose is healing on its own. She was on a ventilator for the evening after surgery. Mom is breathing on her own now, with no tube and oxygen only when she lying down. She was cleared to eat and drink again, after a week without either. Applesauce never tasted so good! She will likely move from ICU to a regular unit tonight or tomorrow. Today she was able to switch to a soft collar and sit up for the first time since she got to the hospital 7 days ago! At Last! Adele is home. Yesterday Adele was driven home by Fred from the NE Sinai Hospital after a full 6 weeks of being in various hospitals. What a relief! She was very pleased to just be able to take a nap without any beeps, alarms, nurses, therapists, housekeeping, or aids waking her up. She will have services from a visiting nurse, a home therapist and a home health aid for a while. She has a shiny new blue walker with a seat and a basket that she will be modeling around town. She is pleased to be home and looking forward to again seeing her favorite trees decorated for the season- Dollar Tree and Christmas Tree Shops of course! Please join us in celebrating the end of a long difficult journey away from home for Adele and in supporting the start of the next phase of her recovery. Today Adele got disappointing news that because her Coumadin level had gotten too high in the past couple of days she could not go home on Tuesday as planned. Her doctor said she had to have two good consecutive daily readings for her to be released safely. This was an unwelcome shock. Adele went through all the phases of coping with a loss- denial, anger, bargaining, depression, and finally acceptance- in the span of one day. She is now resigned to staying until Wednesday in the hopes that she will have "good" Coumadin levels on both Tuesday morning and Wednesday morning so she can leave. Meanwhile the team is setting up services for her at home after she is discharged. The Brockton VNA will provide her with nursing and therapies at home for a while. She can then be referred by her new outpatient cardiologist to a cardiac rehab program. We are also looking into where she wants to see a dietician/ nutritionist for help setting up a new plan for eating in line with both a heart-healthy and diabetic diet. PLEASE help support this difficult change by not bringing her any food or candy that is not sugar-free and low in sodium and low in saturated or trans fat. She has a chance to come through this healthier than she has been in a while. She was very fortunate to have little to no damage from her initial, mild heart attack and it is our hope that she will be able to avoid any repeat problems in the future. Good News! Adele's doctor said she should be going home on Tuesday. That will be a day shy of 6 weeks since she first left home. It will be a welcome homecoming indeed- the best gift we could hope for just between the Channukah and Christmas holidays. What progress she has made! On Friday she was totally off of oxygen and was able to handle 20 steps with the PT. She is more independent with all of her self care after working with the occupational therapist to learn how to handle tasks without putting pressure on her healing sternum. Her Coumadin level has been in the therapeutic range for several days. This morning it was a little high, but her dose will again be adjusted to keep it where it needs to be. So in honor of the snow and the holiday season we are giving a little something back to all of you who have been so generous to Adele with your calls, visits, cards, prayers and love. This is a small gift that is in keeping with Adele's sensibility. We are including a link at the right to an excerpt of "The Santaland Diaries" read by the author David Sedaris. It is a dark and funny account of the author's brief stint as an elf in Macy's Santaland display. It will give you something to remember if you take family to the new Enchanted Village display at Jordan's Furniture, just down the road from the NE Sinai. A copy of the book, "The Santaland Diaries" was given to Adele to read during a prior holiday season that she had to spend in the hospital and she really enjoyed it. We hope you will too. NOTE: From the link you can play the excerpt in NPR's online media player by clicking on the "Listen" icon under the title, download an audio file of the excerpt to play on your computer's media player, or click on the link to read a transcript of the excerpt. Listening to the author, if possible, is more fun than reading transcript. Tonight we kindle the lights of for the 5th day of Hannuka. This reminds us of the miracle in ancient Israel and it is appropriate to reflect on Adele's journey today from (Beth) Israel to the Sinai. Yes her extended vacation continues on what is expected to be the last leg of her journey. In classic Adele style she did not take a camel but was personally chauffeured in a climate controlled vehicle with an individual attendant- and even flashing lights. Some suspect she may have made the journey just so she wouldn't be outdone by her friends in who recently traveled with the Judy Group along a similar route through Israel, Jordan, and Egypt. But that is really just conjecture and I digress. Adele settled in comfortably at Sinai this evening. She remains on anticoagulants and her levels are being adjusted until they are therapeutic. Her oxygen level is better and they were still deciding on whether she would get some oxygen overnight when the last of us left. Her spirits are better as she is closer to home and has successfully navigated through one more difficult challenge. 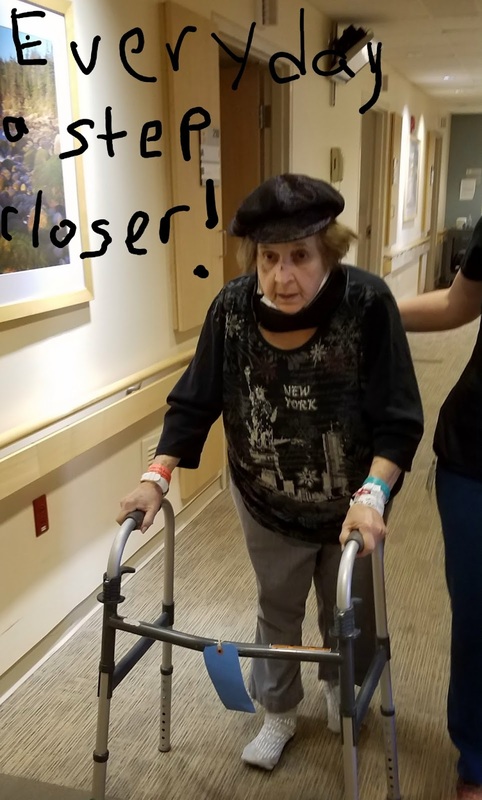 It has now been over 5 weeks that she has been away from home and while the accommodations have been top notch she is really feeling ready to be home again. Hopefully by the end of this Hannuka see will be well on her way to a miraculous recovery and be just about ready to return home from her long journey. Adele has been doing very well on the cardiac unit at the Beth Israel over the past few days. She was up and walking a couple of time today and yesterday. Her balance and strength seem to be coming back. She is just about ready to return to New England Sinai to finish her rehab. She is first waiting for the level of her Coumadin (anticoagulant pills that prevents clotting) to get to a therapeutic level before she is taken off of the intravenous anticoagulant (Heperin) medication. It is not yet clear whether she will go to the rehab with the IV medication or wait a couple of days until she no longer needs it. News of her move will be posted here when the decision gets made. Today Adele was diagnoses with a pulmonary embolism- a blot clot in her lung- that is responsible for her decreased blood oxygen level. Because this is a serious condition she was transfered to the Beth Israel Deaconess Medical Center in Boston . She was admitted to the Intensive Care Unit this evening. There she will be receiving blood thinning agent(s) to prevent further clotting. Many times this is enough to allow her body to take care of the clot on its own without further intervention. The ICU is necessary so that staff can keep a close eye on her oxygen levels and constantly monitor her vital signs in addition to overseeing her medication regimen and administering the supplemental oxygen based on her evolving needs. Fortunately her heart function and blood pressure remain good and she is not in any serious discomfort. Immediate family will be with her tomorrow and will keep folks in the loop as things develop.